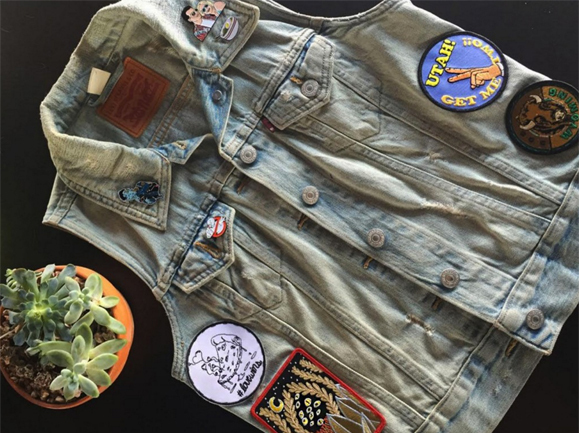 Whether or not you keep up with fashion trends, pins and patches are a fun trend to keep up with. And they’re super in right now. Maybe it’s because the ’90s are coming back with a vengeance. Maybe it’s just because they’re cute and fun. Maybe it’s because you can drop $10 on a pin and your wallet won’t feel guilty for it. But pins and patches aren’t just a great way for you to spice up your backpacks or shirt collars. This is also a trend you can use to your advantage. The pin/patch craze is so strong right now that if you have a cool or cute pin that people dig? You can get buyers posting pictures of it, as well as more people following you, wanting to see what new pins you’ll come out with. 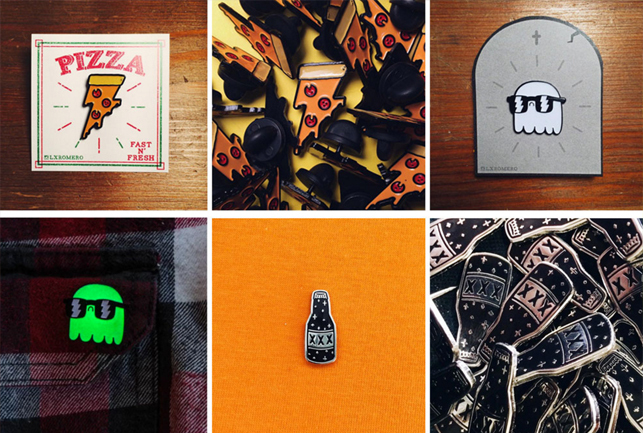 There are also a bunch of great outlets on Instagram especially that post about cool pins and patches. Patchgame and Pinlord are two of the Instagrams that I discover pins and patches on. Accounts like them are great resources to reach out to to see if you can get a shoutout. This is two-fold. Fold one: they can be a great item to sell alongside apparel because although they fulfill a different niche, they can attract people to your apparel, and vice versa. In other words, you’re cross-promoting your tees through your pins, and your pins through your tees. The second fold: you can cross-promo with your customers, encouraging them to take photos of the pins/patches they get from you to act as natural promotion, and in return, giving them shoutouts and regrams/retweets. Danobanano is just one Artist Shop that sells patch designs as t-shirts. I’ve done this as well. 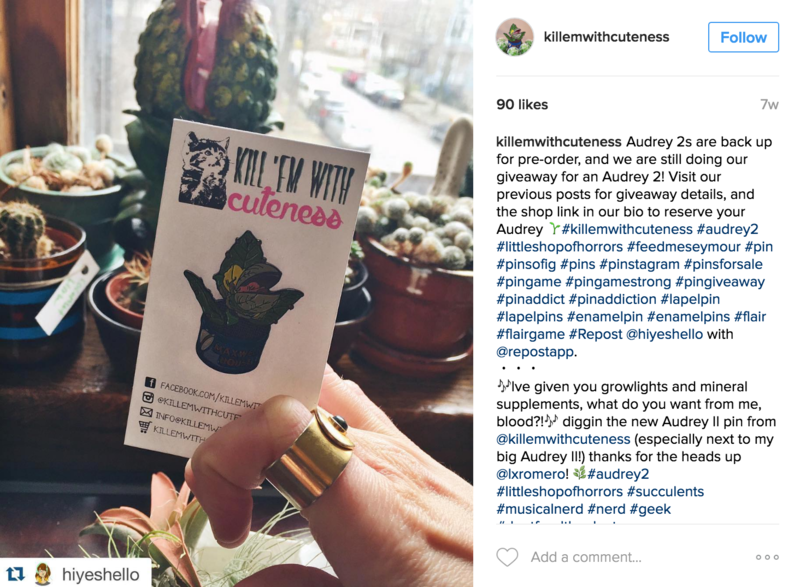 When I got a Little Shop of Horrors Audrey II pin from KillEmWithCuteness, I shared a pic of my pin with my own Audrey II plant in the background, and they shared it on their own account. It’s a great way to make the customer feel appreciated, and maybe even gain THEM some followers, which can only make them feel happy. One great thing about pins? You can throw a bunch in your pocket. You can’t do that with tees…well, unless you make a pin of a tee. 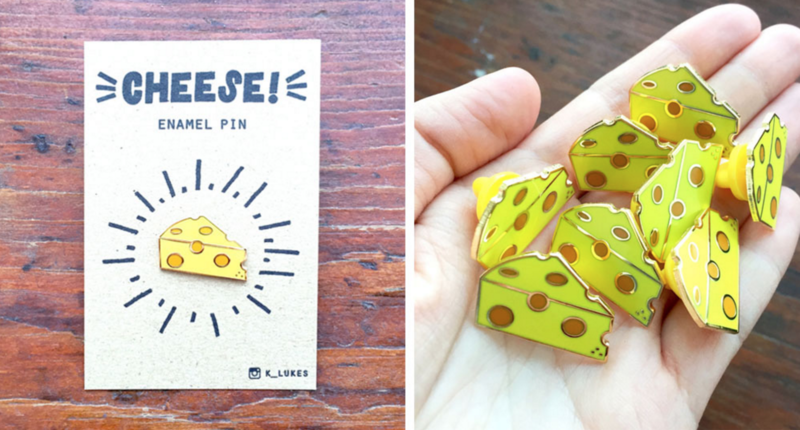 Pins can be a great thing to sell at a store in real life (ex. Luis sells his pins at local Chicago store Rotofugi, as well as on Etsy), and can be a great thing to sell at a booth if you’re doing a con or art fair. Not to mention, you can include your social media links on a nice little card you include with your pin and voila! IRL advertising along with IRL product sales. Pins are a lot easier to get people to dish out quick cash for. $10 for a pin is a lot easier to get people to impulse buy or buy a bunch of. Of course, yes, they are more accessible. But like I said – they’re not the equivalent of hitting the Staples “That was easy” button. So, the choice is yours! Is it an investment? Yes. Is it an easy way out of putting work into gaining followers? Nope. But if you can strike some happy medium, then this might be a good option. Saving this article so I can return to it often!